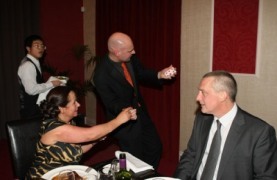 The presence of a world class magician at your corporate event in the Midlands will impress your clients. Magic is an exceptional ice-breaker and will truly enhance your function. David also offers his own unique 'Magic for Marketing' package which has been successfully proven to promote business growth. 1. David will create a customised package for your event. 2. Meticulous planning and preparation will ensure that David's outstanding magic is fed into your function at the correct time. 3. Take all the credit and plaudits for hiring such a fantastic performer. Your clients will be impressed. 4. Enhance your reputation and brand name with a highly skilled practitioner of the magical arts. 5. Your name will be remembered. David Fox will ensure your corporate event is a massive success.